Once again we return to North America, this time to spread the devastation of Terrorvision on our first official Hell over North America headline run. We are super stoked to see many familiar faces again on the road on this ambulant blast beat party, so make sure to not miss out, the line up has most of the Hell over Europe bands and was an absolute blast and makes an evening death metal fans shouldn’t miss out on. 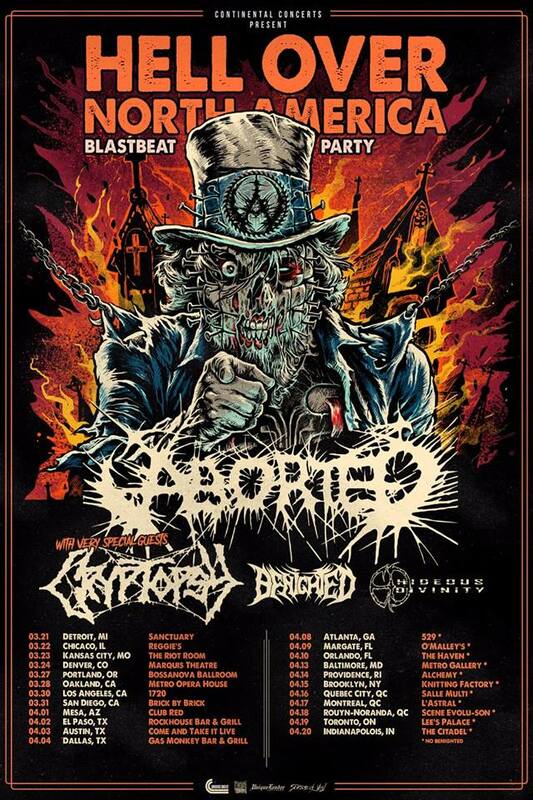 We couldn’t be more stoked to go out again with our good friends in Cryptopsy and Benighted, as well as watch Stefano die from playing twice a night as we haveHideous Divinity who are also embarking on this run. Two european bands who have never played on American soil, don’t miss out, get your tickets and have a good time with all of us! 04/03/19 Austin, TX, Come And Take It Live!